A Chip Off the Old Moon -Astronomers using the NASA/ESA Hubble Space Telescope, along with older data from the Voyager 2 probe, have revealed more about the origin of Neptune's smallest moon. The moon, which was discovered in 2013 and has now received the official name Hippocamp, is believed to be a fragment of its larger neighbour Proteus. A team of astronomers, led by Mark Showalter of the SETI Institute, have used the NASA/ESA Hubble Space Telescope to study the origin of the smallest known moon orbiting the planet Neptune, discovered in 2013. "The first thing we realised was that you wouldn't expect to find such a tiny moon right next to Neptune's biggest inner moon," said Mark Showalter. 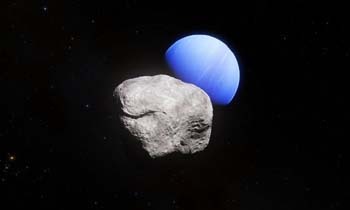 The tiny moon, with an estimated diameter of only about 34 km, was named Hippocamp and is likely to be a fragment from Proteus, Neptune's second-largest moon and the outermost of the inner moons. Hippocamp, formerly known as S/2004 N 1, is named after the sea creatures of the same name from Greek and Roman mythology . The orbits of Proteus and its tiny neighbour are incredibly close, at only 12 000 km apart. Ordinarily, if two satellites of such different sizes coexisted in such close proximity, either the larger would have kicked the smaller out of orbit or the smaller would crash into the larger one. 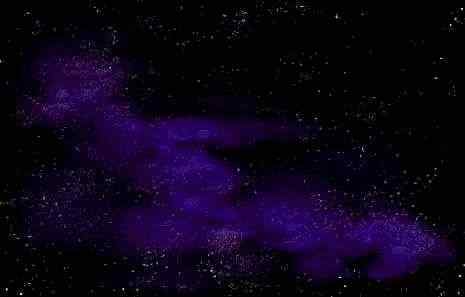 Instead, it appears that billions of years ago a comet collision chipped off a chunk of Proteus. Images from the Voyager 2 probe from 1989 show a large impact crater on Proteus, almost large enough to have shattered the moon. "In 1989, we thought the crater was the end of the story," said Showalter. "With Hubble, now we know that a little piece of Proteus got left behind and we see it today as Hippocamp." Did Volcanoes Kill The Dinosaurs? New Evidence Points To 'Maybe.' - Princeton geoscientists Blair Schoene and Gerta Keller led an international team of researchers who have assembled the first high-resolution timeline for the massive eruptions in India's Deccan Traps, determining that the largest eruption pulse occurred less than 100,000 years before the mass extinction that killed the (non-avian) dinosaurs. Fact: About 66 million years ago, at the end of the Cretaceous period, 75 percent of plant and animal species went extinct, including the dinosaurs (except those that evolved into birds). Fact: About 66 million years ago, an enormous asteroid or comet hit the Earth near what is now Chicxulub, Mexico, throwing rock, dust and water vapor into the atmosphere. Fact: About 66 million years ago, a massive volcano erupted lavas in India that are now called the Deccan Traps, burying much of the subcontinent under more than 11,000 feet of basalt (lava rock) and pouring poisonous gases into the atmosphere. Princeton geoscientists Blair Schoene and Gerta Keller led an international team of researchers who have assembled the first high-resolution timeline for the eruptions in India's Deccan Traps. Their research appears in the Feb. 22 issue of the journal Science. "Everyone has heard that the dinosaurs died from an asteroid hitting the Earth," said Schoene, an associate professor of geosciences. "What many people don't realize is that there have been many other mass extinctions in the last 500 million years, and many of them coincide with large volcanic outpourings" from the massive volcanoes known as flood basalts or large igneous provinces. Keller, a professor of geosciences, has argued for decades that the eruption of the Deccan Traps caused the dinosaur mass extinction. Pottery Reveals America's First Social Media Networks - Long before Snapchat, Instagram, Facebook and even MySpace, early Mississippian Mound cultures in America's southern Appalachian Mountains shared artistic trends and technologies across regional networks that functioned in similar ways as modern social media, suggests new research from Washington University in St. Louis. "Just as we have our own networks of 'friends' and 'followers' on platforms like Facebook and Twitter, societies that existed in North America between 1,200 and 350 years ago had their own information sharing networks," said Jacob Lulewicz, lecturer of archaeology in the Department of Anthropology in Arts & Sciences. "Our study found a way to reconstruct these indigenous communication networks," he said. "Our analysis shows how these networks laid the groundwork for Native American political systems that began developing as far back as 600 A.D." Embargoed for release Feb. 18 in the Proceedings of the National Academy of Sciences, the study utilizes sophisticated social network analysis to map social and political connections that helped unite friends and families in dozens of Native American villages well before the arrival of European explorers. The findings are based on a messaging archive that is preserved not in bytes, but in bits of pottery sherds -- fragments -- unearthed over many years in archaeology digs at dozens of Mississippian culture sites scattered across southern Appalachia. Focusing on subtle evolving changes in the technologies used to temper and strengthen pottery and the cultural symbols used to decorate them, the study provides a detailed chronological map of how new pottery techniques signified connections between these communities. The ceramics database includes 276,626 sherds from 43 sites across eastern Tennessee, and 88,705 sherds from 41 sites across northern Georgia. The collection represents pottery created between 800 and 1650 A.D., a period that saw the gradual emergence and later decline of powerful chiefdoms that controlled wide networks of villages in the region. Older Biologic Age Linked To Elevated Breast Cancer Risk - Biologic age, a DNA-based estimate of a person's age, is associated with future development of breast cancer, according to scientists at the National Institutes of Health. Biologic age was determined by measuring DNA methylation, a chemical modification to DNA that is part of the normal aging process. The study showed for every five years a woman's biologic age was older than her chronologic or actual age, known as age acceleration, she had a 15 percent increase in her chance of developing breast cancer. The study was published online Feb. 22 in the Journal of the National Cancer Institute. Scientists from the National Institute of Environmental Health Sciences (NIEHS), part of NIH, speculate that biologic age may be tied to environmental exposures. If so, it may be a useful indicator of disease risk. They used three different measures, called epigenetic clocks, to estimate biologic age. These clocks measure methylation found at specific locations in DNA. Researchers use these clocks to estimate biologic age, which can then be compared to chronologic age. The researchers used DNA from blood samples provided by women enrolled in the NIEHS-led Sister Study, a group of more than 50,000 women in the U.S. and Puerto Rico. The study was specifically designed to identify environmental and genetic risk factors for breast cancer. The research team measured methylation in a subset of 2,764 women, all of whom were cancer-free at the time of blood collection. "We found that if your biologic age is older than your chronologic age, your breast cancer risk is increased. The converse was also true. If your biologic age is younger than your chronologic age, you may have decreased risk of developing breast cancer," said corresponding author Jack Taylor, M.D., Ph.D., head of the NIEHS Molecular and Genetic Epidemiology Group. "However, we don't yet know how exposures and lifestyle factors may affect biologic age or whether this process can be reversed." Foxes Were Domesticated By Humans In The Bronze Age - In the northeast of the Iberian Peninsula, between the third and second millennium BC, a widespread funeral practice consisted in burying humans with animals. Scientists have discovered that both foxes and dogs were domesticated, as their diet was similar to that of their owners. The discovery of four foxes and a large number of dogs at the Can Roqueta (Barcelona) and Minferri (Lleida) sites stands out among the many examples of tombs in different parts of the north-eastern peninsula. These burials reveal a generalized funeral practice that proliferated in the Early to Middle Bronze Age: that of burying humans together with domestic animals. What is most striking about these sites is the way of burying the dead in large silos, along with their dogs and a few foxes. "We discovered that in some cases the dogs received a special kind of food. We believe this is linked to their function as working dogs. Besides, one of the foxes shows signs of having already been a domestic animal in those times," Aurora Grandal-d'Anglade, co-author of a study on the relationship between humans and dogs through their diet published in the journal Archaeological and Anthropological Sciences, has said. "The case of the Can Roqueta fox is very special, because it is an old animal, with a broken leg. The fracture is still in its healing process, and shows signs of having been immobilized (cured) by humans. The feeding of this animal is very unusual, as it is more akin to a puppy dog's. We interpret it as a domestic animal that lived for a long time with humans," explains Grandal. There are several Cleopatra's in Egyptian history, but the most famous one was Cleopatra VII. She was the last Pharaoh of Egypt, at a time just before the country was completely taken over by the Rome. Cleopatra herself was not of Egyptian heritage, but Greek. In 331BC Alexander the Great (who was from a section of Greece) liberated Egypt when he defeated the Persian Empire. After Alexander's death in 232BC, Egypt fell under control of one of Alexander's generals, Ptolemy. The Ptolemy family kept power there until Cleopatra was born to her father, Ptolemy XII, in 69BC. Cleopatra showed great interest in the traditions of Egypt and was the only member of her family in 300 years that bothered to learn the language. She followed the Egyptian beliefs and while she ruled she was considered the re-incarnation and embodiment of, Isis, the Egyptian goddess of wisdom. When her father died in 51 BC, a 17 year-old Cleopatra and her 12-year-old brother, Ptolemy XIII, took over. In addition to be siblings, Cleo and her brother were married (a common trick used to keep power in the family back then). Cleo attempted to push her husband/bother into the background and get sole control of the kingdom, but lost the battle and was forced to flee Egypt. Cleopatra's chance to get back into power came in 48BC when a political miscalculation by her brother got the Roman ruler Julius Caesar angry with him. Cleopatra took advantage of this situation: It is said that she had her servants bring an expensive Persian carpet to Caesar as a gift. When it was unrolled, Cleopatra tumbled out. Caesar, age 50, enchanted by her beauty and youth (she was only 21) and fell in love with her. He helped her returned her to the Egyptian throne which led to Ptolemy XIII's death. Caesar and Cleo had a son, Caesarion, together. It was Caesar's plan to have Caesarion rule Egypt after his death and leave Rome to grand-nephew, Octavian. Cleopatra, however, wished her son to be heir to all of Rome. When Caesar was killed by members of the Roman Senate in 44BC, Cleopatra made Caesarion her co-regent and successor. Later she allied herself with Mark Anthony, one of the three men ruling Rome after Caesar's death. They married and had children. It is likely that Cleopatra had plans to take on Rome and make herself and her son rulers of the known world, but the Romans, under Octavian, attacked first. Anthony and Cleopatra's forces were defeated at the naval battle off the coast of Actium. Soon the armies of Rome were marching through Egypt and Anthony was mortally wounded in battle. Cleopatra was held under house arrest and commited suicide (legend has it that she killed herself by letting a deadly Asp snake bite her) in 30BC at the age of 39. Cleopatra is remembered for her immense beauty and even more immense ambition. She ruled in a time when Greek women were expected to be submissive to their husbands. Instead of taking a back seat to men, however, she cleverly used her charms to gain political advantages over her enemies and was nearly successful in ruling the known world. Jefferson's Giant Sloth - On March 10th In 1797, Thomas Jefferson presented a paper to the American Philosophical Society. It was entitled "A Memoir on the Discovery of Certain Bones of a Quadruped of the Clawed Kind in the Western Parts of Virginia," in Transactions of American Philosophical Society. This paper on a bear-sized extinct ground sloth is the first American publication in paleontology and also the only paleontology paper ever written by Jefferson. In 1822, this creature was named Megalonyx jeffersoni by a French naturalist. Supermoon - On March 21st the Moon will be located on the opposite side of the Earth as the Sun making its face fully illuminated. Native Americans called this the Full Worm Moon because this was the time of year the earth would become soft and worms would first appear. This will be the last of three supermoons for 2019 as it will appear bigger and brighter than usual. Scientific Maverick Still Argues for UFO - Oumuamua, that interstellar object discovered by astronomers in late 2017, and dismissed by most as high speed rock, has a least one creditable scientist that still thinks in might be an alien spaceship. Chairman of Harvard University's astronomy department, Avi Loeb, thinks its behavior doesn't fit any natural phenomenon he can think of. "Considering an artificial origin, one possibility is that 'Oumuamua" - pronounced Oh-mooah-mooah - "is a lightsail, floating in interstellar space as a debris from an advanced technological equipment," Loeb wrote in an article in Astrophysical Journal Letters last November. Loeb thinks that his calculations show that the object is accelerating as it moves away from the sun as if it was catching the solar wind to increase its speed. While Loeb's comments have excited UFO enthusiasts, his thoughts have been met with skepticism by most of his scientific peers. "A shocking example of sensationalist, ill-motivated science," theoretical astrophysicist Ethan Siegel wrote in Forbes magazine. Copyright Lee Krystek 2019. All Rights Reserved.